This article is about the Christian view of the Holy Spirit. For the Holy spirit in other religions, see Holy Spirit. "Holy Ghost" redirects here. For other uses, see Holy Ghost (disambiguation). 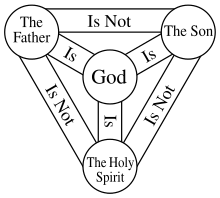 For the majority of Christian denominations, the Holy Spirit or Holy Ghost is the third person (hypostasis) of the Trinity: the Triune God manifested as God the Father, God the Son,and God the Holy Spirit; each entity itself being God.Nontrinitarian Christians, who reject the doctrine of the Trinity, differ significantly from mainstream Christianity in their beliefs about the Holy Spirit and generally fall into several distinct categories such as Unitarianism, Binitarianism, Modalism, and others. Some Christian theologians identify the Holy Spirit with the Ruach Hakodesh in Jewish scripture, and with many similar names including the Ruach Elohim (Spirit of God), Ruach YHWH (Spirit of Yahweh), and the Ruach Hakmah (Spirit of Wisdom). In the New Testament it is identified with the Spirit of Christ, the Spirit of Truth, the Paraclete and the Holy Spirit. The Holy Spirit is referred to as "the Lord, the Giver of Life" in the Nicene Creed, which summarises several key beliefs held by many Christian denominations. The participation of the Holy Spirit in the tripartite nature of conversion is apparent in Jesus' final post-resurrection instruction to his disciples at the end of the Gospel of Matthew (28:19): "make disciples of all the nations, baptizing them into the name of the Father and of the Son and of the Holy Spirit," and "For where two or three are gathered together in my name, there am I in the midst of them." Since the first century, Christians have also called upon God with the trinitarian formula "Father, Son and Holy Spirit" in prayer, absolution and benediction. In the book of the Acts of the Apostles the arrival of the Holy Spirit happens fifty days after the resurrection of the Christ, and is currently celebrated in Christendom with the feast of Pentecost. In Christian theology, pneumatology refers to the study of the Holy Spirit. The Koine Greek word pneûma (πνεῦμα, pneuma) is found around 385 times in the New Testament, with some scholars differing by three to nine occurrences. Pneuma appears 105 times in the four canonical gospels, 69 times in the Acts of the Apostles, 161 times in the Pauline epistles, and 50 times elsewhere. These usages vary: in 133 cases, it refers to "spirit" in a general sense and in 153 cases to "spiritual". [clarification needed] Around 93 times, the reference to the Holy Spirit, sometimes under the name pneuma and sometimes explicitly as the pneûma tò Hagion (Πνεῦμα τὸ Ἅγιον). (In a few cases it is also simply used generically to mean wind or life.) It was generally translated into the Vulgate as Spiritus and Spiritus Sanctus. The English terms "Holy Ghost" and "Holy Spirit" are complete synonyms: one derives from the Old English gast and the other from the Latin loanword spiritus. Like pneuma, they both refer to the breath, to its animating power, and to the soul. The Old English term is shared by all other Germanic languages (compare, e.g., the German Geist) and is older, but the King James Bible used both interchangeably, and 20th-century translations of the Bible overwhelmingly prefer "Holy Spirit", probably because the general English term "ghost" has increasingly come to refer only to the spirit of a dead person. What the Hebrew Bible calls "Spirit of God" and "Spirit of Elohim" is called in the Talmud and Midrash "Holy Spirit" (ruacḥ ha-kodesh). Although the expression "Holy Spirit" occurs in Ps. 51:11 and in Isa. 63:10–11, it had not yet acquired quite the same meaning which was attached to it in rabbinical literature: in the latter it is equivalent to the expression "Spirit of the Lord". In Gen.1:2 God's spirit hovered over the form of lifeless matter, thereby making the Creation possible. Although the ruach ha-kodesh may be named instead of God, it was conceived of as being something distinct; and, like everything earthly that comes from heaven, the ruach ha-kodesh is composed of light and fire. The most characteristic sign of the presence of the ruach ha-kodesh is the gift of prophecy. The use of the word "ruach" (Hebrew: "breath", or "wind") in the phrase ruach ha-kodesh seems to suggest that Judaic authorities believed the Holy Spirit was a kind of communication medium like the wind. The spirit talks sometimes with a masculine and sometimes with a feminine voice; the word ruacḥ is both masculine and feminine. The term Holy Spirit appears at least 90 times in the New Testament. The sacredness of the Holy Spirit to Christians is affirmed in all three Synoptic Gospels (Matthew 12:30–32, Mark 3:28–30 and Luke 12:8–10) which proclaim that blasphemy against the Holy Spirit is the unforgivable sin. The participation of the Holy Spirit in the Trinity is suggested in Jesus' final post-Resurrection instruction to his disciples at the end of the Gospel of Matthew (28:19): "Go ye therefore, and make disciples of all the nations, baptizing them into the name of the Father and of the Son and of the Holy Spirit". The Holy Spirit is mentioned by all three authors of the synoptic Gospels. Most of the references are by the author of the Gospel of Luke; this emphasis is continued by the same author in the Book of Acts. The Holy Spirit does not simply appear for the first time at Pentecost after the resurrection of Jesus, but is present in the Gospel of Luke (in 1–2) prior to the birth of Jesus. 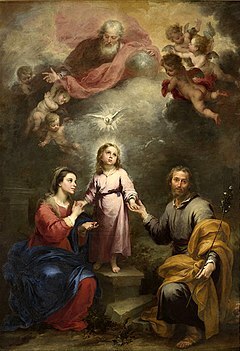 In Luke 1:15, John the Baptist was said to be "filled with the Holy Spirit" prior to birth, and the Holy Spirit came upon the Virgin Mary in Luke 1:35. In Luke 3:16 John the Baptist stated that Jesus baptized not with water but with the Holy Spirit; and the Holy Spirit descended on Jesus during his baptism in the Jordan River. In Luke 11:13 Jesus provided assurances that God the Father would "give the Holy Spirit to those who ask him". Mark 13:11 specifically refers to the power of the Holy Spirit to act and speak through the disciples of Jesus in time of need: "be not anxious beforehand what ye shall speak: but whatsoever shall be given you in that hour, that speak ye; for it is not ye that speak, but the Holy Spirit." Matthew 10:20 refers to the same act of speaking through the disciples, but uses the term "Spirit of your Father". The sacredness of the Holy Spirit to Christians is affirmed in all three Synoptic Gospels (Matthew 12:30–32, Mark 3:28–30 and Luke 12:8–10) which proclaim that blasphemy against the Holy Spirit is the unforgivable sin. Together, Luke–Acts contain over half of the references in the New Testament to the Holy Spirit although this author wrote approximately 25% of the content of the New Testament. The Acts of the Apostles has sometimes been called the "Book of the Holy Spirit" or the "Acts of the Holy Spirit". Of the seventy or so occurrences of the word Pneuma in Acts, fifty-five refer to the Holy Spirit. From the start, in Acts 1:2, the reader is reminded that the ministry of Jesus, while he was on earth, was carried out through the power of the Holy Spirit and that the "acts of the apostles" continue the acts of Jesus and are also facilitated by the Holy Spirit. Acts presents the Holy Spirit as the "life principle" of the early Church and provides five separate and dramatic instances of its outpouring on believers in 2:1–4, 4:28–31, 8:15–17, 10:44 and 19:6. References to the Holy Spirit appear throughout Acts, for example Acts 1:5 and 8 stating towards the beginning: "For John indeed baptized with water; but ye shall be baptized in the Holy Spirit ... ye shall receive power, when the Holy Spirit is come upon you" referring to the fulfillment of the prophecy of John the Baptist in Luke 3:16: "he shall baptize you in the Holy Spirit". Three separate terms, namely Holy Spirit, Spirit of Truth and Paraclete are used in the Johannine writings. The "Spirit of Truth" is used in John 14:17, 15:26 and 16:13. The First Epistle of John then contrasts this with the "spirit of error" in 1 John 4:6. 1 John 4:1–6 provides the separation between spirits "that confesseth that Jesus Christ is come in the flesh is of God" and those who in error refuse it—an indication of their being evil spirits. In John 14:26 Jesus states: "But the Comforter, [even] the Holy Spirit, whom the Father will send in my name, he shall teach you all things". The identity of the "Comforter" has been the subject of debate among theologians, who have proposed multiple theories on the matter. The Holy Spirit plays a key role in the Pauline epistles; and the Apostle Paul's pneumatology is closely connected to his theology and Christology, to the point of being almost inseparable from them. The First Epistle to the Thessalonians, which was likely the first of Paul's letters, introduces a characterization of the Holy Spirit in 1:6 and 4:8 which is found throughout his epistles. In 1 Thessalonians 1:6 Paul refers to the imitation of Christ (and himself) and states: "And ye became imitators of us, and of the Lord, having received the word in much affliction, with joy of the Holy Spirit", whose source is identified in 1 Thessalonians 4:8 as "God, who giveth his Holy Spirit unto you". These two themes of receiving the Spirit "like Christ" and God being the source of the Spirit persist in Pauline letters as the characterization of the relationship of Christians with God. For Paul the imitation of Christ involves readiness to be shaped by the Holy Spirit, as in Romans 8:4 and 8:11: "But if the Spirit of him that raised up Jesus from the dead dwelleth in you, he that raised up Christ Jesus from the dead shall give life also to your mortal bodies through his Spirit that dwelleth in you." The First Epistle to the Thessalonians also refers to the power of the Holy Spirit in 1:5, a theme also found in other Pauline letters. 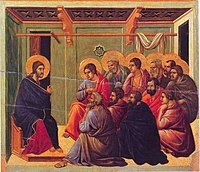 In the Farewell Discourse Jesus promised to send the Holy Spirit to his disciples after his departure, depiction from the Maesta by Duccio, 1308–1311. The New Testament details a close relationship between the Holy Spirit and Jesus during his earthly life and ministry. The Apostles' Creed echoes the statements in the Gospels of Luke and Matthew, stating that Jesus was conceived by the Holy Spirit and born of Mary. "Spirit without measure" having been given to Jesus in John 3:34, referring to the word spoken by Jesus (Rhema) being the words of God. Acts 1:2 states that until his death and resurrection, Jesus "had given commandment through the Holy Spirit unto the apostles"
Referring to the sacrifice of Jesus to be crucified out of obedience to the father, Hebrews 9:14 states that Jesus "through the eternal Spirit offered himself without blemish unto God"
In his Farewell Discourse to his disciples, Jesus promised that he would "send the Holy Spirit" to them after his departure, in John 15:26 stating: "whom I will send unto you from the Father, [even] the Spirit of truth ... shall bear witness of me". The theology of spirits is called pneumatology. The Holy Spirit is referred to as the Lord and Giver of Life in the Nicene creed. He is The Creator Spirit, present before the creation of the universe and through his power everything was made in Jesus Christ, by God the Father. Christian hymns such as Veni Creator Spiritus reflects this belief. In early Christianity, the concept of salvation was closely related to the invocation of the "Father, Son and Holy Spirit". and since the first century, Christians have called upon God with the name "Father, Son and Holy Spirit" in prayer, baptism, communion, exorcism, hymn-singing, preaching, confession, absolution and benediction. This is reflected in the saying: "Before there was a 'doctrine' of the Trinity, Christian prayer invoked the Holy Trinity". For the majority of Christian denominations, the Holy Spirit is the third Person of the Holy Trinity—Father, Son, and Holy Spirit, and is Almighty God. The Holy Spirit is understood to be one of the three persons of the Trinity. As such he is personal and also fully God, co-equal and co-eternal with God the Father and Son of God. He is different from the Father and the Son in that he proceeds from the Father (and, according to Roman Catholics, Old Catholics, Anglicans, and Protestants, from the Father and the Son) as described in the Nicene Creed. The Triune God is thus manifested as three Persons (Greek hypostases), in One Divine Being (Greek: Ousia), called the Godhead (from Old English: Godhood), the Divine Essence of God. In the New Testament, by the power of the Holy Spirit Jesus was conceived in the womb of the Virgin Mary, while maintaining her virginity. The Holy Spirit descended over Jesus in a corporeal way, as a dove, at the time of his baptism, and a voice from Heaven was heard: "This is my beloved Son with whom I am well pleased." He is the Sanctifier of souls, the Helper, Comforter, the Giver of graces, he who leads souls to the Father and the Son. The Holy Spirit is credited with inspiring believers and allowing for them to interpret all the sacred scripture and leads prophets, both in Old Testament and New Testament. Christians receive the Fruits of the Holy Spirit by means of his mercy and grace. The Christian doctrine of the Trinity includes the concept of God the Holy Spirit, along with God the Son and God the Father. Theologian Vladimir Lossky has argued that while in the act of the Incarnation, God the Son became manifest as the Son of God, the same did not take place for God the Holy Spirit which remained unrevealed. Yet, as in 1 Corinthians 6:19, God the Spirit continues to dwell in bodies of the faithful.. In a similar way, the Latin treatise De Trinitate (On the Trinity) of Saint Augustine of Hippo affirms: "For as the Father is God, and the Son is God, and the Holy Spirit is God, which no one doubts to be said in respect to substance, yet we do not say that the very Supreme Trinity itself is three Gods, but one God... But position, and condition, and places, and times, are not said to be in God properly, but metaphorically and through similitudes... And as respects action (or making), perhaps it may be said most truly of God alone, for God alone makes and Himself is not made. Nor is He liable to passions as far as belongs to that substance whereby He is God... So the Father is omnipotent, the Son omnipotent, and the Holy Spirit is omnipotent; yet not three omnipotents, but one omnipotent... Whatever, therefore, is spoken of God in respect to Himself, is both spoken singly of each Person, that is, of the Father, and the Son, and the Holy Spirit; and together of the Trinity itself, not plurally but in the singular.". In Christian theology the Holy Spirit is believed to perform specific divine functions in the life of the Christian or the church. The action of the Holy Spirit is seen as an essential part of the bringing of the person to the Christian faith. The new believer is "born again of the Spirit". The Holy Spirit enables Christian life by dwelling in the individual believers and enables them to live a righteous and faithful life. The Holy Spirit also acts as comforter or Paraclete, one who intercedes, or supports or acts as an advocate, particularly in times of trial. And he acts to convince the unredeemed person both of the sinfulness of their actions, and of their moral standing as sinners before God. Another faculty of the Holy Spirit is the inspiration and interpretation of scripture. The Holy Spirit both inspires the writing of the scriptures and interprets them to the Christian and the church. In John 15:26 Jesus says of the Holy Spirit: "But when the Helper comes, whom I will send to you from the Father, the Spirit of truth, who proceeds from the Father, he will bear witness about me." In 325, the First Council of Nicaea, being the first ecumenical council, ended its Creed with the words "and in the Holy Spirit". In 381, the First Council of Constantinople, being the second ecumenical council, expanded the Creed and stated that Holy Spirit "proceeds from the Father" (ἐκ τοῦ Πατρὸς ἐκπορευόμενον). This phrase was based on John 15:26 (ὃ παρὰ τοῦ πατρὸς ἐκπορεύεται). In 451, the Council of Chalcedon, being the fourth ecumenical council, affirmed the Nicene-Constantinopolitan Creed. In the same time, the question of procession of the Holy Spirit was addressed by various Christian theologians, expressing diverse views and using different terminology, thus initiating the debate that became focused on the Filioque clause. In 589, the Third Council of Toledo in its third canon officially accepted the doctrine of the procession of the Holy Spirit from the Father and the Son ("a Patre et Filio procedere"). During the next few centuries, two distinctive schools of thought were gradually shaped, Eastern and Western. Eastern theologians were teaching that Holy Spirit proceeds from the Father only (notion referred as monoprocessionism), while Western theologians were teaching that Holy Spirit proceeds from the Father and the Son (notion referred as filioquism). Debates and controversies between two sides became the main point of difference within the Christian pneumatology. In the Epistle to the Galatians these nine characteristics are in contrast to the "works of the flesh" and highlight the positive manifestations of the work of the Holy Spirit in believers. The "gifts of the Holy Spirit" are distinct from the Fruit of the Spirit, and consist of specific abilities granted to the individual Christian. They are frequently known by the Greek word for gift, charisma, in English charism, from which the term charismatic derives. There is no generally agreed upon exhaustive list of the gifts, and various Christian denominations use different lists, often drawing upon 1 Corinthians 12, Romans 12 and Ephesians 4. Pentecostal denominations and the charismatic movement teach that the absence of the supernatural gifts was due to the neglect of the Holy Spirit and his work by the major denominations. Believers in the relevance of the supernatural gifts sometimes speak of a Baptism with the Holy Spirit or Filling with the Holy Spirit which the Christian needs to experience in order to receive those gifts. However, many Christian denominations hold that the Baptism with the Holy Spirit is identical with conversion, and that all Christians are by definition baptized in the Holy Spirit. The "seven gifts of the Holy Spirit" pour out on a believer at baptism, and are traditionally derived from Isaiah 11:1–2, although the New Testament does not refer to Isaiah 11:1–2 regarding these gifts. These 7 gifts are: wisdom, understanding, counsel, fortitude (strength), knowledge, piety and fear of the Lord. This is the view of the Catholic Church and many other mainstream Christian groups. Christian denominations have doctrinal variations in their beliefs regarding the Holy Spirit. A well-known example is the Filioque controversy regarding the Holy Spirit – one of the key differences between the teachings of the main Western Churches and various Eastern Christian denominations (Eastern Orthodox, Oriental Orthodox, Church of the East). The Filioque debate centers around whether the Nicene Creed should state that the Spirit "proceeds from the Father" and then have a stop, as the creed was initially adopted in Greek (and followed thereafter by the Eastern Church), or should say "from the Father and the Son" as was later adopted in Latin and followed by the Western Church, filioque being "and from the Son" in Latin. Towards the end of the 20th century, discussions took place about the removal of Filioque in the Nicene Creed from Anglican prayer books along the lines of the Eastern Orthodox and Oriental Orthodox approach, but these still have not reached a state of final implementation. The majority of mainstream Protestantism hold similar views on the theology of the Holy Spirit as the Roman Catholic Church, but there are significant differences in belief between Pentecostalism and the rest of Protestantism. Pentecostalism has a focus on "Baptism with the Spirit", relying on Acts 1:5 which refers to "now you will baptize with the Holy Spirit". The more recent Charismatic movements have a focus on the "gifts of the Spirit" (such as healing, prophecy, etc.) and rely on 1 Corinthians 12 as a scriptural basis, but often differ from Pentecostal movements. The topic of the Holy Spirit is discussed extensively in the Catechism of the Catholic Church as "I believe in the Holy Spirit" in Paragraphs 683 through 747. The doctrine of the Holy Spirit as expressed in the Nicene Creed has been a point of difference between the Catholic Church and the Eastern Orthodox Church. See Filioque clause. Jehovah's Witnesses view the Holy Spirit, not as an actual person separate from God the Father, but as God's eternal "energy" or "active force", that he uses to accomplish his will in creation and redemption. Members of The Church of Jesus Christ of Latter-day Saints believe that the Holy Ghost is the third member of the Godhead. He is a personage of spirit, without a body of flesh and bones. He is often referred to as the Spirit, the Holy Spirit, the Spirit of God, the Spirit of the Lord, or the Comforter. Members of The Church of Jesus Christ of Latter-day Saints believe in a social trinitarianism and subordinationism, meaning that the Father, the Son, and the Holy Ghost are understood as being unified in will and purpose, but not in substance. The Holy Ghost is believed to be subordinate to the Father and the Son and operates under their direction. The Holy Ghost, like all intelligent beings, is believed to be fundamentally eternal, uncreated, and self-existent. The Church of Jesus Christ of Latter-day Saints teaches that the influence of the Holy Ghost can be received before baptism, but the gift, or constant companionship, of the Holy Ghost, which comes by the laying-on of hands by a properly ordained Priesthood Holder with a line of authority traced back to Christ through Peter, is obtained only after baptism. Joseph Smith, the founding prophet of The Church of Jesus Christ of Latter-day Saints, taught "You might as well baptize a bag of sand as a man," he said, "if not done in view of the remission of sins and getting of the Holy Ghost. Baptism by water is but half a baptism, and is good for nothing without the other half-that is, the baptism of the Holy Ghost". Another Stoic concept which offered inspiration to the Church was that of 'divine Spirit'. Cleanthes, wishing to give more explicit meaning to Zeno's 'creative fire', had been the first to hit upon the term pneuma, or 'spirit', to describe it. Like fire, this intelligent 'spirit' was imagined as a tenuous substance akin to a current of air or breath, but essentially possessing the quality of warmth; it was immanent in the universe as God, and in man as the soul and life-giving principle. Clearly it is not a long step from this to the 'Holy Spirit' of Christian theology, the 'Lord and Giver of life', visibly manifested as tongues of fire at Pentecost and ever since associated – in the Christian as in the Stoic mind – with the ideas of vital fire and beneficient warmth. The Holy Spirit is frequently referred to by metaphor and symbol, both doctrinally and biblically. Theologically speaking these symbols are a key to understanding of the Holy Spirit and his actions, and are not mere artistic representations. Water – signifies the Holy Spirit's action in Baptism, such that in the manner that "by one Spirit [believers] were all baptized", so they are "made to drink of one Spirit". [1Cor 12:13] Thus the Spirit is also personally the living water welling up from Christ crucified[Jn 19:34][1 Jn 5:8] as its source and welling up in Christians to eternal life. The Catechism of the Catholic Church, item 1137, considers the Water of Life reference in the Book of Revelation (21:6 and 22:1) "one of most beautiful symbols of the Holy Spirit". Anointing – The symbolism of bless with oil also signifies the Holy Spirit, to the point of becoming a synonym for the Holy Spirit. The coming of the Spirit is referred to as his "anointing". [2Cor 1:21] In some denominations anointing is practiced in Confirmation; ("chrismation" in the Eastern Churches). Its full force can be grasped only in relation to the primary anointing accomplished by the Holy Spirit, that of Jesus. The title "Christ" (in Hebrew, messiah) means the one "anointed" by God's Spirit. Fire – symbolizes the transforming energy of the Holy Spirit's actions. In the form of tongues "as of fire", the Holy Spirit rested on the disciples on the morning of Pentecost. The Holy Spirit has been represented in Christian art both in the Eastern and Western Churches using a variety of depictions. The depictions have ranged from nearly identical figures that represent the three persons of the Holy Trinity to a dove to a flame. 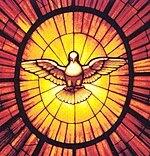 The Holy Spirit is often depicted as a dove, based on the account of the Holy Spirit descending on Jesus like a dove when he was baptized in the Jordan. 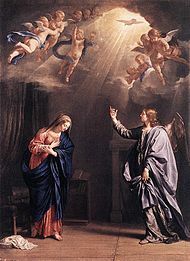 In many paintings of the Annunciation, the Holy Spirit is shown in the form of a dove, coming down towards Mary on beams of light, as the Archangel Gabriel announces Jesus Christ's coming to Mary. A dove may also be seen at the ear of Saint Gregory the Great─as recorded by his secretary or other church father authors, dictating their works to them. The dove also parallels the one that brought the olive branch to Noah after the deluge, as a symbol of peace. The book of Acts describes the Holy Spirit descending on the apostles at Pentecost in the form of a wind and tongues of fire resting over the apostles' heads. 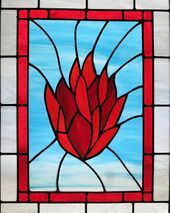 Based on the imagery in that account, the Holy Spirit is sometimes symbolized by a flame of fire. ^ The Heavenly and Earthly Trinities on the site of the National Gallery in London. ^ a b c d Millard J. Erickson (1992). Introducing Christian Doctrine. Baker Book House. p. 103. ^ a b c d T C Hammond, Revised and edited by David F Wright (1968). In Understanding be Men:A Handbook of Christian Doctrine (sixth ed.). Inter-Varsity Press. pp. 54–56 and 128–131. ^ a b Grudem, Wayne A. 1994. Systematic Theology: An Introduction to Biblical Doctrine. Leicester, England: Inter-Varsity Press; Grand Rapids, MI: Zondervan page 226. ^ a b Catechism of the Catholic Church: Expectation of the Messiah and his Spirit (nos. 711–712). ^ a b c Millard J. Erickson (1992). Introducing Christian Doctrine. Baker Book House. pp. 267–268. ^ "Pentecost". Encyclopedia Britannica. Retrieved 2017-06-03. Pentecost... major festival in the Christian church, celebrated on the Sunday that falls on the 50th day after Easter. ^ a b c d Companion Bible–KJV–Large Print by E. W. Bullinger, Kregel Publications, 1999. ISBN 0-8254-2099-7. Page 146. ^ "Norfolk schools told Holy Ghost 'too spooky'". The Guardian. London. 2005-04-11. Retrieved 2010-05-04. ^ Interlinear Bible on Bible Hub. ^ a b c d Interlinear Bible on Bible Hub. ^ "Strong's Hebrew: 1847. דָּ֫עַת (daath) -- knowledge". biblehub.com. Retrieved 2019-01-04. ^ Karl Barth (1949). Dogmatics in Outline. New York Philosophical Library. p. 95. ^ a b c "Catholic Encyclopedia:Holy Spirit". ^ Pope Pius XII (1943). Mystici Corporis Christi. Archived from the original on 2011-08-24. Retrieved 2011-04-10. Herbermann, Charles, ed. (1913). "Person" . Catholic Encyclopedia. New York: Robert Appleton Company. ^ CCC: The Dogma of the Holy trinity. ^ "De Trinitate, Book V, chapter 8". newadvent.org. Archived from the original on Oct 13, 1999. ^ a b c Millard J. Erickson (1992). Introducing Christian Doctrine. Baker Book House. pp. 265–270. ^ T C Hammond, Revised and edited by David F Wright (1968). In Understanding be Men:A Handbook of Christian Doctrine (sixth ed.). Inter-Varsity Press. p. 134. ^ Martínez-Díez & Rodriguez 1992, p. 79. ^ Wilhite 2009, pp. 285-302. ^ Phillips 1995, pp. 60. ^ a b c d e CCC nos. 1830–32. ^ a b c d e f Erickson, Millard J. (1992). Introducing Christian Doctrine. Grand Rapids, Michigan: Baker Publishing Group. ISBN 978-0-8010-3215-8. 2nd ed. 2001. Chapter Thirty – "The work of the Holy Spirit" (pp. 275ff.). ISBN 978-0-8010-2250-0. ^ a b c Shaw, Russell; Stravinskas, Peter M. J. (1998). Our Sunday Visitor's Catholic Encyclopedia. Huntington, Indiana: Our Sunday Visitor Publishing. p. 457. ISBN 978-0-87973-669-9. ^ Kasper, Walter. The Petrine ministry. Catholics and Orthodox in Dialogue: Academic Symposium Neld at the Pontifical Council for Promoting Christian Unity. Paulist Press. p. 188. ISBN 978-0-8091-4334-4. ^ Kinnamon, Michael; Cope, Brian E. (1997). The Ecumenical Movement: An Anthology of Key Texts and Voices. Wm. B. Eerdmans Publishing. p. 172. ISBN 978-0-8028-4263-3. ^ David Watson (1973). One in the Spirit. Hodder and Stoughton. pp. 39–64. ^ "Is the Holy Spirit a Person?". Awake! : 14–15. July 2006. In the Bible, God's Holy Spirit is identified as God's power in action. Hence, an accurate translation of the Bible's Hebrew text refers to God's spirit as "God's active force." ^ "True to the Faith", p. 81. ^ "Learning about the Godhead"
^ Marcus Aurelius (1964). Meditations. London: Penguin Books. p. 25. ISBN 0-14044140-9. ISBN 978-0-140-44140-6. ^ a b c d e f David Watson (1973). One in the Spirit. Hodder and Stoughton. pp. 20–25. ^ a b c d e CCC: Symbols of the Holy Spirit (nos. 694–701). Martínez-Díez, Gonzalo; Rodriguez, Felix (1992). Colección canónica hispana. 5. Madrid: Consejo Superior de Investigaciones Científicas. Phillips, Andrew (1995). Orthodox Christianity and the English Tradition. Frithgarth, UK: Anglo-Saxon Books. Burgess, Stanley M. (1989). The Holy Spirit: Eastern Christian Traditions. Peabody, Mass. : Hendrickson Publishers. Kärkkäinen, Veli-Matti (2002). Pneumatology: The Holy Spirit in Ecumenical, International, and Contextual Perspective. Grand Rapids, MI: Baker Academic. Kärkkäinen, Veli-Matti, ed. (2010). Holy Spirit and Salvation: The Sources of Christian Theology. Louisville, KY: Westminster John Knox Press.